I am a lucky girl. I returned home from vacation to find a book waiting for me--a book generously sent by the author and signed to me. Imagine my dismay upon opening the bent and torn envelope to find the book in tatters. Here's a glimpse. The interior actually looks much worse. As sad as this was for me, I was already in possession of a copy I pre-ordered from Amazon. Since life handed me lemons, I am going to make lemonade. I have decided to laminate a few of the photos to use in a lesson on classification and a few of the poems to hang over my desk for a wee bit of inspiration. I'm also going to take a pair of my son's "funky" scissors and cut out the lovely note from the author and paste it in the new book. Problem solved. 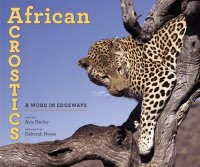 African Acrostics: A Word in Edgeways, written by Avis Harley with photographs by Deborah Noyes, was recently published by Candlewick Press. It begins this way. Now you're just the right age. This introductory poem is a perfect example of one of the things I love about Avis' poetry. I find her "teacher voice" in nearly everything she writes. What is so amazing about this is that her voice isn't the least bit didactic. I see, I hear, I feel, I imagine and above all, learn from what I read. With this one poem I've already begun thinking about the acrostic form in a different way, and I love the notion of a "word in edgeways." Avis does more than write simple acrostics in this book, so let's skip to the end for a moment. Readers will find an endnote about the form in which Avis describes and provides examples of the types found in the book, such as the double acrostic, multiple acrostic, cross acrostic, and more. The text contains 18 poems, each accompanied by a gorgeous photograph of the animal described. The photographer, Deborah Noyes, provides stunning views of each creature and provides a note at the end of the text describing her experiences capturing them. Also included are a series of brief Nature Notes on each animal. 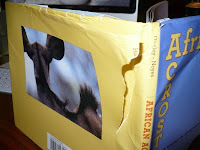 Poems cover the crocodile, rhino, kudu, lion, hornbill, elephant, stork, zebra, giraffe, buffalo, ostrich, African wildcat, lioness, bonobo, impala, hippo, bat-eared fox, and leopard. The poems in this book are deftly created. The words spelled out vertically range from single words (herald, lying, poppet, outstanding) to phrases (wild stripes, cloud friends, fatherly advice, beauty in the beast). The double acrostics, quintuple acrostic (yes, that's FIVE words), and concrete acrostic deserve some special attention. The patterns that exist within them never get in the way of the poem itself, and finding them is a bit of a surprise. My favorite poem, however, is this simple rhyming acrostic. This book is a winner, from the poems to the photographs. I highly recommend it for all collections. Avis has taken the otherwise prosaic acrostic to places no one ever imagined it could go. And her books on forms are sui generis. I love acrostics, and I adored Avis' butterfly book, so I can't wait to read this one! That crocodile poem--wow, so much imagery in such a very short poem. Thanks, Tricia, for letting us know this one was out. I had heard about it and was looking forward to it--even more so now! And Deb Noyes sure is multi-talented. I didn't know she was a photographer, too, besides being an author and an editor! A Renaissance woman. Happy Birthday Mary Ann Hoberman!